A Male and Female in Winter plumage in flight. Note the very distinct black breast and neck of the Male, and the long tail. The Male Long-tailed duck in Winter plumage has a long black tail, a white and grey body, white neck, black breast band, black neck patch and a white head. The bill is pink and black. Breeds in the very North of Europe, namely Scandinavia and Iceland. Winters of the coast around the UK and it's breeding grounds. Considered a globally vulnerable bird, the population is in rapid decline. Around 11,000 birds Winter around the UK but only a fraction of these are seen due to it's maritime habits. 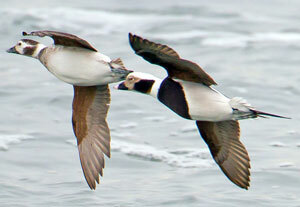 The Long-tailed duck is a maritime bird, only coming near to shore because of storms or the need to breed. In the UK they are most often seen in Spring, where they sometimes enter sheltered bays and large estuaries. Occasionally, and often for no apparent reason, a single bird can turn up on a freshwater pond or lake near the sea and stay for long periods. The preferred breeding habitat is remote moorland, often a good distance from the sea. The Long-tailed duck often flocks with Scoters and whilst the seasonal markings of the bird can be confusing they are usually distinctive, even from a distance. The Male in Summer is a much darker bird, however the long tail and white face patch is very distinctive. The Male also has white rear flanks which can often be seen at a distance. The Female Long-tailed duck is much browner than the Male but she still has a distinctive facial pattern and a pointed tail, although not as long as the Male. The flanks of the Female are bright white, however in the image above she has her wing down covering the flank. 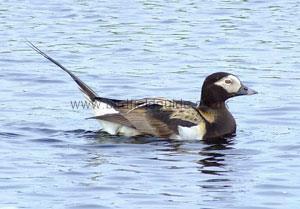 The Female Long-tailed duck in Summer can be much harder to identify. The primary means of identification are the pointed tail, white neck patch and white band behind the eye. 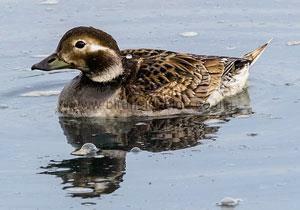 A Female Long-tailed duck in Winter plumage as is most often seen, at a distance on the open sea.